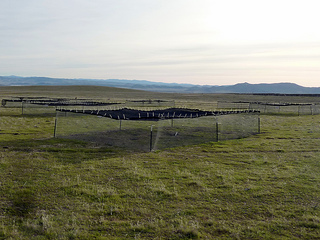 We piloted permitting, species and habitat mitigation, and monitoring and compliance support efforts at the California Valley Solar Ranch (CVSR). This nearly 1600-acre solar facility in eastern San Luis Obispo County provides 250 megawatts of renewable energy to Pacific Gas and Electric Company’s utility grid. In this resource-rich site, we worked with the development team to avoid most impacts to special-status species by carefully siting the arrays and roadways. We developed an extensive mitigation plan for the remaining impacts, which helped preserve and enhance nearly 10,000 acres of on-site and nearby habitats. Our team crafted and implemented more than 200 interwoven biological compliance requirements, and monitored resources and construction activities. We worked with agencies, stakeholders, and contractors throughout the project. To mitigate project impacts, our restoration experts developed detailed habitat restoration plans and specifications—including construction documents—for approximately 2000 acres of grasslands and shrub lands. The CVSR project site is home to the endangered giant kangaroo rat, as well as the endangered San Joaquin kit fox and the State-protected San Joaquin antelope squirrel. We quickly identified the project site’s giant kangaroo rat precincts, and burrows of the San Joaquin kit fox. After a thorough assessment of the giant kangaroo rat population and mapping the precincts, we worked with the development team to minimize impacts on the species. We then assisted with plans for array relocation with the goal of preserving more than 95% of the existing population. We developed a relocation plan which was reviewed and vetted with other giant kangaroo rat experts and agency specialists. We refined a method for building artificial precincts for giant kangaroo rat relocation. Using these techniques we successfully relocated nearly 230 individual giant kangaroo rats. More than a year later, monitoring showed that the animals not only have expanded the artificial precincts built by our ecologists, but have also built natural precincts around the artificial ones. This is an indication that the kangaroo rats are successfully breeding and expanding their populations in those areas. We worked with the development team to design the arrays to be permeable to San Joaquin kit foxes. In addition we developed a management and restoration plan for the preserved lands and arrays. Through the construction process, and post-construction monitoring, we documented that kit foxes have remained within the project site. To minimize avian impacts our ecologists developed a stringent, cutting-edge scientific protocol to study the solar farm’s effects on birds. Our method involves thoroughly analyzing avian activity and mortality at the project site and in nearby areas prior to, construction, through the construction cycle, and during the start of project operations. To protect nesting birds and allow work to progress, we surveyed the active construction areas daily during the nesting season and implemented nesting deterrence measures to avoid harm to eggs or birds. Environmental work for the CVSR project extends far beyond the construction area. For approximately 10,000 acres of mitigation and conservation lands required for the project, we developed long-term management plans, including livestock grazing lands, and management endowments through a Property Analysis Record process. The conservation lands are predominantly California annual grassland, alkaline seasonal wetland, and desert sink scrub habitats that support a variety of sensitive plant and wildlife species. On the project site, the development and construction teams were faced with multiple constraints related to biological resources. Jurisdictional habitats and waterways necessitated particular treatment, and biological requirements applied throughout the site. We provided compliance monitors to ensure that all obligations were successfully met.